Lee Govatos Slightly Off-Kilter Since 1972. One of my favorite things about the internet is the pleasant surprises. 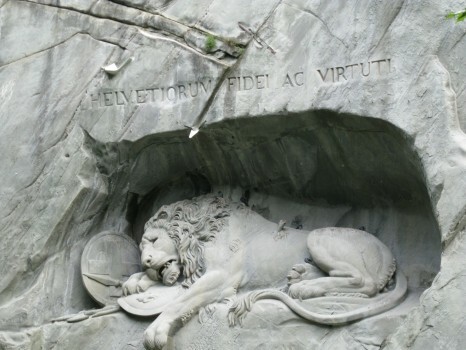 I had never heard of or seen the Löwendenkmal (or Lion of Lucerne) before today, but a couple of clicks through random mode on Imgur got me to the quote above, and the picture below. Sculpted by Lukas Ahorn in 1821, it (according to Wikipedia) "commemorates the Swiss Guards who were massacred in 1792 during the French Revolution, when revolutionaries stormed the Tuileries Palace in Paris, France." "The Lion lies in his lair in the perpendicular face of a low cliff — for he is carved from the living rock of the cliff. His size is colossal, his attitude is noble. 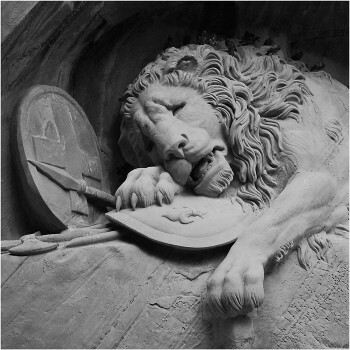 His head is bowed, the broken spear is sticking in his shoulder, his protecting paw rests upon the lilies of France. Vines hang down the cliff and wave in the wind, and a clear stream trickles from above and empties into a pond at the base, and in the smooth surface of the pond the lion is mirrored, among the water-lilies. Around about are green trees and grass. The place is a sheltered, reposeful woodland nook, remote from noise and stir and confusion — and all this is fitting, for lions do die in such places, and not on granite pedestals in public squares fenced with fancy iron railings. The Lion of Lucerne would be impressive anywhere, but nowhere so impressive as where he is." It's an impressive reminder of why I need to both travel and read more. More importantly, it's motivation to do so at a time when I kind of need it. Thanks, internet. Use the promo code "LEE" and save $20 on your website hosting!